It's been a busy time for the SMWS recently, with the launch of the Vaults Collection topping a few changes that have caused concern amongst members. I commented on this over at Malt Review, so will simply note that the Vaults Collection isn't part of the normal Outturn and therefore will be reviewed separately. 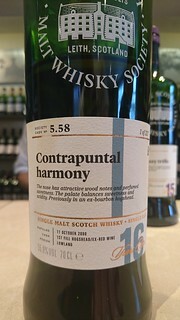 Regardless of the perception of the SMWS, there are some cracking whiskies on this list. We have score of 5 with the Bladnoch, which is a superb and succulent dram. Then there's a remarkable four (FOUR!) drams that scored 4.5 - the fruit-laden Miltonduff, the beautifully balanced Highland Park, the slightly waxy Glen Grant and the tropical fruit of the Glenrothes. As if those high scores weren't enough, we then see four scoring 4! The deliciously sweet Glentauchers, the fruity and floral Glenburgie, and finally the the fruity Dailuaine and Linkwood. It's not all moments of wonder and joy - I did find the Tullibardine and the Strathmill were both on the wrong side of spiciness for me. Some housekeeping - the Bladnoch is the first bottle with the new black label style for bottles priced G and above. An interesting change, but I'm not really a packaging person so couldn't quite care! Also, the Laphroaig wasn't available due to labelling issues, and the Cragganmore is mail order only so didn't arrive in London. 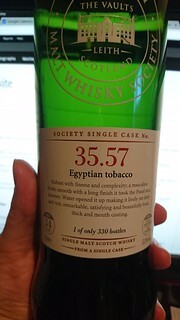 But it wouldn't be a true SMWS list without something being missing! Another month, another outturn. It's the same old story. 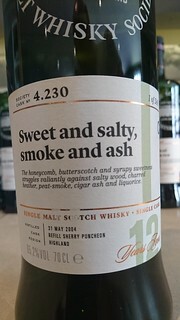 Some interesting cask finishes, a good range of flavour profiles, and some excellent whiskies. 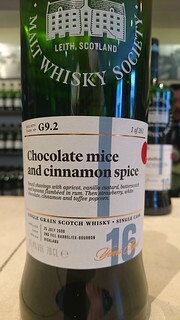 Oh, and the SMWS's second ever blended malt. And boy, did that ever cause some fuss amongst the traditionalists! So let's get it out of the way - I have no problem with the Scotch Malt Whisky Society creating a blended malt. We've bottled Irish, Japanese, American and Welsh whiskies. We've bottled grain whiskies. We've bottle Armagnac, cognac, rum, gin, cider brandy. For those who are complaining that this is "not what the Society is about" - these casks were Scottish Malt Whisky when they were blended. It's not a Single Malt Whisky Society. 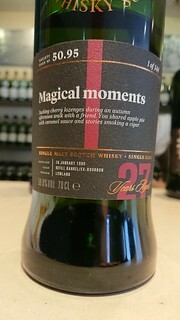 I've long believed that the SMWS should do interesting things that help whisky drinkers broaden their experiences and challenge their preconceptions. So I'm a fairly happy bunny. So, way from the hubbub and drama - how were the other drams? Lots of spice on this list. My favourite was the Auchentoshan, followed by the Linkwood and the Exotic Cargo itself. There were plenty of decent whiskies, but nothing else really stood out for me. Not all lists can be packed with brilliance, but this one's certainly got plenty of decent whiskies to drink. I'm hoping that the Society will follow up the Exotic Cargo with a bourbon-cask based blend. But I think that will take a while! An unusual outturn this month - with plenty of rum, cognac and our first gin! Maybe they put four peated drams in to try and placate the traditionalists? Logistical issues continue, with two bottlings absent - 3.302 and R8.3. Hopefully they're not completely lost to us and will turn up eventually. There are three excellent drinks on this list: the sweet, fruity Balmenach; the floral and delicate Glen Grant, and the delightful C4.1 cognac. A cognac as one of my picks of the list? That's unexpected, but well deserved! There are lots of excellent drams too - the Glen Scotia, the Aberlour, the Dailuaine, the Craigellachie and the R10.1 all impressed enough to score a 4. Standards didn't slip because of the other spirits, despite some people's fears. And I quite enjoyed trying all the cognacs and rums - it was an interesting change of scenery. I hope we manage to get more rums and cognacs in future. Yet more logistical issues, albeit fewer than before. The Ardmore (66.104) wasn't available and the G15.1 is delayed. This is an ideal July list - it's hot out there, and this list is packed with light and sweet drams. And there are many excellent drams here. The best was the Highland Park, which is a peated joy and gets a full score. Oddly nothing scored 4.5, but there were plenty of drams scoring a solid and well-deserved 4: Cragganmore, Balblair, Glen Deveron (Macduff), Glenburgie, Glenlivet and the Mortlach all impressed. I think this list really demonstrates the value of the Society's recent cask finishes. Some have disliked the use of virgin oak and other custom casks, but three of my picks were Virgin Oak or French Oak. I'm far more concerned about having a decent dram than having conformity to some nebulous idea of either tradition or purity. The end may not justify the means in many moral areas, but in whisky maturation I think some leeway can be allowed. 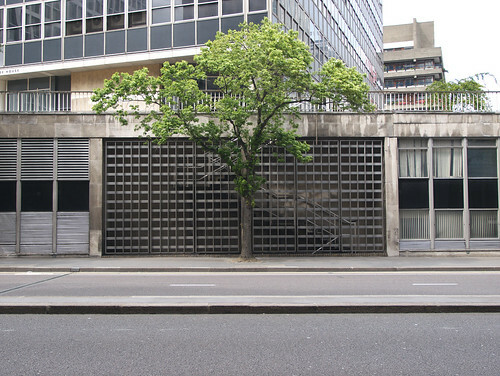 I simply like the composition of the tree in front of the fire escape, and then all that 1960's office block behind it. The 7.168 is yet again delayed due to labelling issues, and the 37.91 was advertised as arriving mid-month and then failed to turn up. 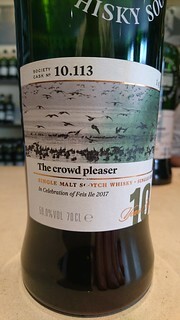 But to make up for it, there are three special Feis Ile 2017 bottlings. That having been said, time to move on to the list itself. And it's a bit chalk and cheese for me this month. A lot of the drams I thought I'd like didn't score as high as I'd hoped, because they suddenly became dominated by spicy notes when I added water. I don't think I've written the word "cinnamon" so often! And yet there are three drams scoring 4.5 - the sherry monster that is the Glenrothes, the peaty joy that is the Bunnahabhain, and the younger of the two Highland Parks. If you had the light and sweet drams in the betting pool, I feel sorry for you! There are also three drams that get a respectable score of 4. The younger Bowmore balances fruit with smoke delightfully. The Ardmore tastes like a Caol Ila, which is no bad thing! The Auchentoshan has a lovely light sherrying, very well handled. 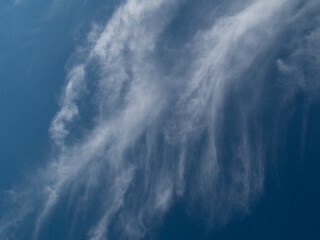 These clouds remind me of tidal estuaries on an aerial photograph, with little tributaries forming in the deeper channels as the tide is out. A mirror in the sky of what happens on the ground. Some bottles are fond memories that are burnished with every recollection - the only thing as satisfying as that memory is discovering that it was accurate. So it was with hope and trepidation that I selected this to share with people for my birthday this year. 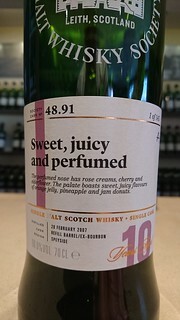 The SMWS has two outturns this May, due to bottling issues. So where we starved with six bottles at the start of the month, we now feast with sixteen! Elsewhere, the Glenlossie was superb. A friend - who's famed for disliking sherried whiskies - walked away with two bottles. I'd say that's fairly high praise! The Glenlivet is great, the Bladnoch is delicious, then try the Laphroaig and finish on the ashen joy of the superb Bowmore. One other thing to note is that the Islays were both one bottle per member. Given the sales, I think this is a good move - everyone should have a chance at that Bowmore, and restricting members to a bottle each helps with that! Owing to some issues with labelling, it's a very short list this month - something should arrive mid-month to compensate! The Glen Moray was the best, but the Glendullan and the Balmenach are also excellent, and the Glen Ord is a great peated dram for warmer days. Not a bad hit rate for such a short list!